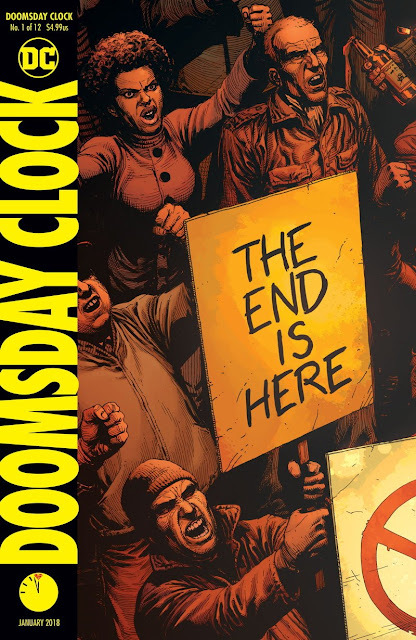 "Doomsday Clock" die im November startende (jetzt) zwölfteilige Maxi-Serie vom Autoren- & Zeichner- Team Geoff Johns und Gary Frank wird die “Button / Watchmen” Storylines aus dem megaerfolgreichen "Rebirth" Oneshot zum Abschluß bringen. 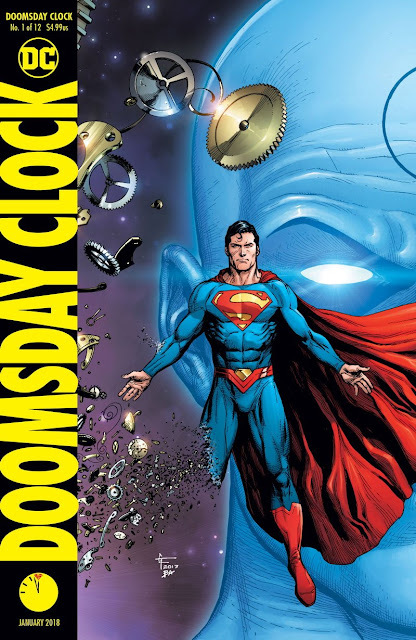 Geoff Johns hat gestern die beiden Haupt-Cover Motive ("A" + "B") der ersten Ausgabe der "Doomsday Clock" vorgestellt. 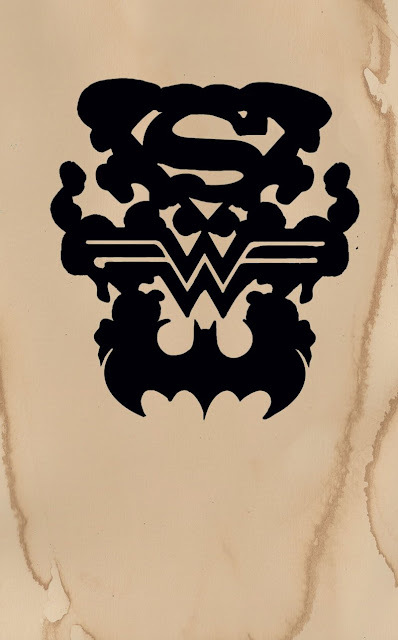 Das Heft wird zusätzlich auch wieder "Lenticular" ("Wackel"-Cover) haben. "Excelsior!" 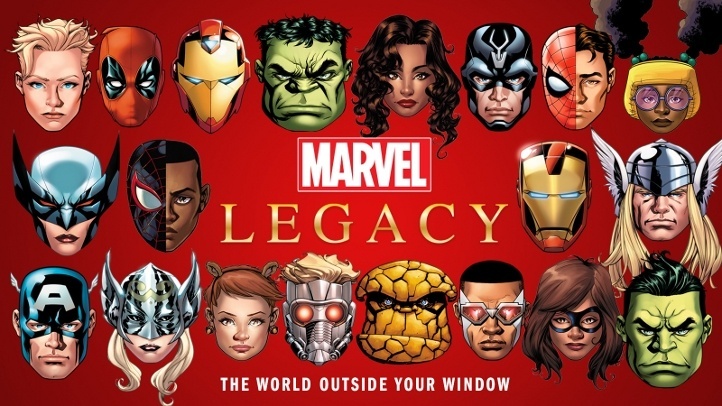 - MARVEL LEGACY - Weitere Titel ! "Marvel is also excited to unveil the lenticular cover for CAPTAIN AMERICA #695, featuring a homage cover by Alex Ross based on the classic 1968 IRON MAN #126 cover by John Romita Jr. and Bob Layton." 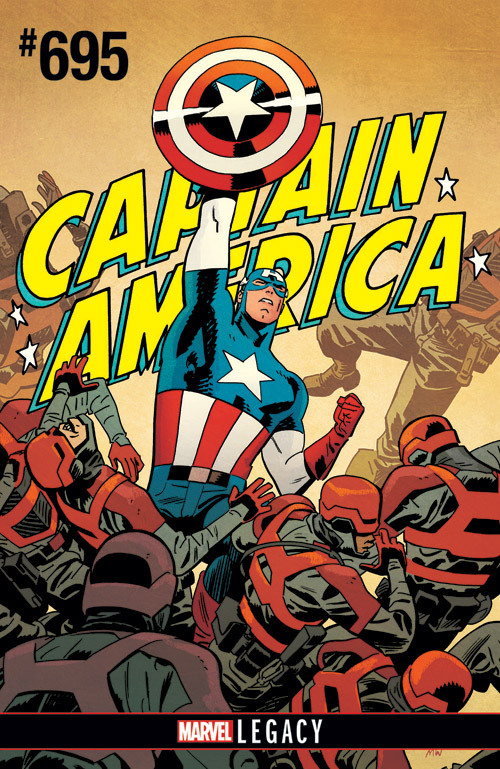 Marvel's Angaben sind auch hier (wieder einmal) fehlerhaft, denn der neue, von Alex Ross gestaltete "Homage Cover" für CAPTAIN AMERICA # 695 basiert auf einem IRON MAN Heft, das 1979 erschienen ist (und nicht, wie der Verlag behauptet, "1968")! Marvel hat außerdem inzwischen weiteres zum Inhalt des "Marvel Legacy" oneshots bekanntgegeben. Neben Greg Land und Esad Ribic beteiligen sich jetzt auch noch Steve McNiven, Russell Dauterman, Chris Samnee, Alex Maleev, Stuart Immonen, Pepe Larraz, Jim Cheung, Daniel Acuna und Ed McGuinness an dem ca. 50 seitigen Heft. 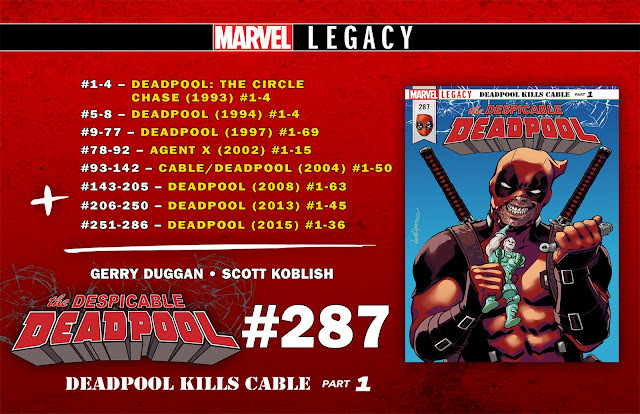 Marvel verspricht Comic-Händlern und Comic-Lesern vollmundig das dieses Special bzw. die "Legacy" - Initiative (Zitat:) "...will change the industry!" ...man darf also gespannt sein. 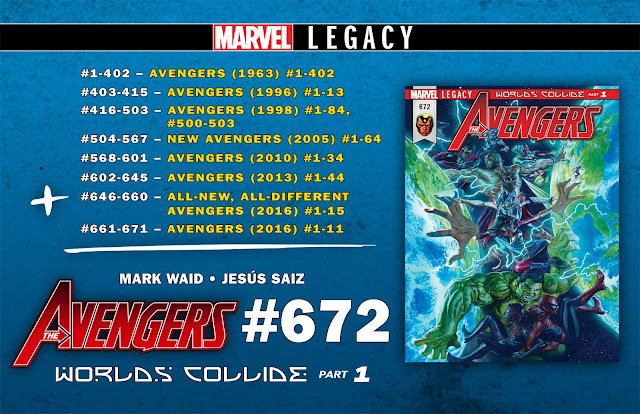 This fall, MARVEL LEGACY #1 breaks the barriers of the Marvel Universe with a rich and exciting 50-page one shot that will take you back to the dawn of time with the introduction of 1,000,000 BC Avengers – and sets the stage for the returns and surprises to come in MARVEL LEGACY! 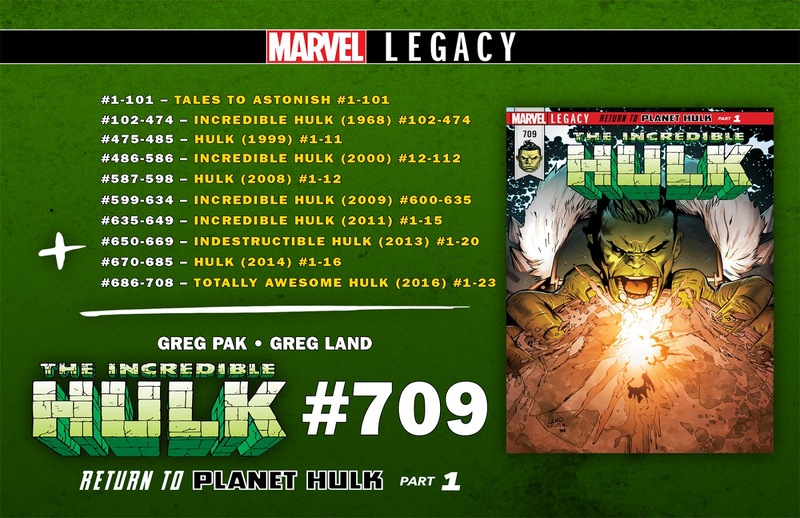 And the biggest story in the Marvel Universe just got more spectacular. “Because the events of MARVEL LEGACY #1 impact on so many corners of the Marvel Universe and reflect the upcoming storylines in so many of our titles, it only made sense to call on the artists most associated with those titles to cement the connection,” so Marvels Tom Brevoort. Who sent the call from Planet Hulk? What is hunting for the infinity stones? Where in the world is Captain America? When will Thor fight the war of realms? Why does jean grey journey to Canada? 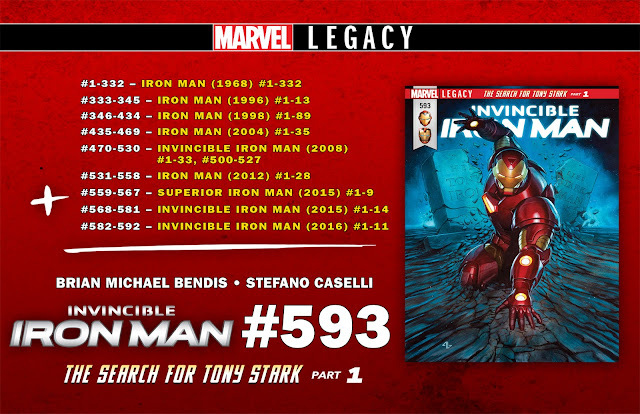 How has the body of Iron Man disappeared? 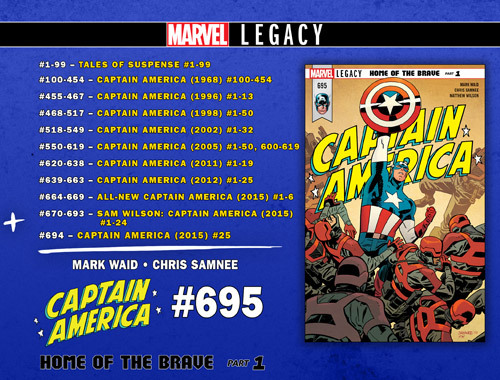 Das 50seitige "Marvel Legacy" #1 wird zum Coverpreis von $5.99 -!- Ende September ausgeliefert werden. auf der US- Wikipedia, HIER!